When it comes to shorts, traditional cycling shorts with a chamois pad are not usually necessary for bent riders because recumbent bikes have different seats with more support and padding. Instead of padded shorts, multi-panel compression shorts are great options for bent riders to take advantage of muscle compression and moisture wicking. Recumbent riders can have a tendency to build heat in the saddle area,so the use of a wicking fabric is needed to keep dry and comfortable. Recumbent riders have special needs for riding apparel as they are seated without the ischial bone support. The upright position and the seated position create unique demands for riding. Aero Tech is always trying to come up with better ideas to keep our fellow recumbent riders more comfortable. We understand the issues of visibility and special "hot spots" for avid riders. As we develop our products, our goal is always to keep you riding longer, and feeling stronger. The shorts we recommend below are stretchy and provide you with complete freedom of movement for the cycling motion on a recumbent bicycle. Ride Longer..fellow Bent Riders...See you on the road! Ergonomically designed recumbent bicycles create new opportunities for comfort by allowing the rider to pedal from a reclined position with their feet extended forward. Preferred by riders with neck and arm issues, recumbent bikes create a different cycling posture that allows the cyclist to have their weight supported in a basket-type seat, which takes pressure off of their neck and arms. Recumbent bikes, of course, have a very specialized version of measurements and categories when it comes to frames, posture and positioning. In particular, wheelbase and x-seam measurements can be important, similar to a cyclist’s inseam measurement on a traditional upright bicycle. Recumbent bicycles position the cyclist in a reclined, laid-back position, which is good for ergonomic reasons. A cyclist’s weight is distributed a little different than on an upright bike and it comfortably spread over a larger area, mainly across the buttocks and back. With an upright bicycle, the rider’s weight is transferred to the saddle in a very small area: the rider’s sit bones. Padded cycling shorts and bib shorts help to alleviate this sit bone pressure and provide comfort in this scenario, but some riders’ health needs dictate that a more comfortable recumbent position is more beneficial. This reclined position achieved with a recumbent bicycle also has an advantage over its upright counterparts: aerodynamics. Reclined, legs-forward posture on a recumbent creates a smaller front profile of the cyclist and some models even place the rider in a head-first position. Long Wheelbase Bike (LWB): A bicycle’s wheelbase is defined as the distance from the center of your front wheel’s hub to the center of your rear wheel’s hub. A long wheelbase bike usually has a wheelbase in the range of 65 to 71 inches. This style provides a smooth, comfortable, stable and often fast ride. However, due to the bike’s length, agile maneuvering at low speeds can be challenging in tight quarters, including narrow bike paths or busy urban streets. Short Wheelbase Bike (SWB): Significantly shorter with about a 33- to 45-inch wheelbase is the short wheelbase bike. The front wheel of this style is underneath or slightly beyond the rider’s knees and the crankset is mounted on a boom. These differences allow for more maneuverability and quicker handling. The frame is also more compact, which makes transport and storage a little easier. Compact Long Wheelbase Bike (CLWB): Perfect for beginner “bent” cyclists, the compact long wheelbase bike’s wheelbase measures between 46 and 64 inches. Advantages include stability, great responsiveness and a higher seat that improves visibility (for the rider as well as others on the road who can notice the bike easier). These benefits make the CLWB a great commuter recumbent bicycle. Lowracer: As the name implies, this style has a saddle height under 12 inches and you can actually put your hand down to the ground at routine stops during your ride. Lowracer’s usually have short wheelbases, though longer wheelbase versions can be found as well. The low front profile creates a very fast bike and riders are also less affected by headwinds and crosswinds because they tend to slow down as they near the ground. Seats are usually composed of a harder shell and feature a greater reclined angle (they are more “laid back”). Highracer: This recumbent style usually uses two matching 700cc wheels, rather than differing wheel sizes that are found in other frame styles. The seat position is usually similar to the lowracer and the larger wheels and efficient drivetrain make this style among the fastest for hilly terrain and bumpy roads. Moving Bottom Bracket (MBB): Not necessarily the first choice for beginners, moving bottom bracket recumbent frames use a drivetrain that actually allows the pedals to move with the steering. This change enables the drivetrain to be very efficient, resulting in very fast recumbent bikes. Prone: Hinted at earlier, the prone style is designed to be ridden head-first as you lay on your stomach. Trikes: Trikes, of course, use three wheels to complete their frame to produce a very stable experience. Recumbent bicycle frames with two wheels in the front are called tadpole trikes, whereas delta trikes position two wheels in the rear. Tadpole trikes excel at cornering while delta trikes are more stable at higher speeds. Weights and prices range drastically as each version is designed a little differently. 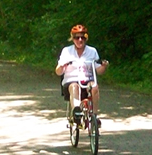 Overall, recumbent trikes are not as fast as traditional recumbent bikes, but sacrificing speed enables the rider to achieve greater balance and stability. Handcycles: Many manufacturers have designed hand-powered handcycles that allow parapalegics and individuals who are unable to use their legs to pedal a traditional crank system or bicycle drivetrain. Most designs feature two rear wheels that coast and one front wheel that is steerable. The handcyclist powers the front wheel by turning handholds that are mounted in phase, meaning that the pedals are in the same position rather than 180 degrees opposite from one another (as you traditionally see on most upright bikes and recumbent bicycles). Brake levers are also usually mounted onto the handholds as well, giving the handcyclist easy access to their brakes. Variations include lean-steer designs and versions with two front wheels and one coaster rear wheel. The “Million Mile Man” Danny Chew is a former Race Across America (RAAM) winner who is vying to finish the last leg of his quest for one million miles by riding a handcycle. He is an amazing athlete and his years of endurance cycling will continue to serve him well in his new challenges. Price: As with many purchases, price and budget come first. Generally, recumbent bikes are more expensive than traditional frames because the market is more specialized (so they aren’t yet mass produced) and they use more parts than their upright counterparts. Lower prices recumbent bikes are easy to ride and they are fairly serviceable, but they tend to be heavier than higher priced options. If you are on a limited budget or you are classified more as a casual rider then starting with a low-priced “bent” may be a great option for you. As you progress and begin riding more often and enjoying the bent lifestyle then you can work up to a higher priced option. Or, if you’ve been riding for years and you’re able to go with a high-end recumbent then you’ll notice that your options include lighter weight frames, high-end components and stronger suspension systems to both make you more aerodynamic and increase your speed and control while on the road. Rider Height and Weight: Rider height plays a key role in the style of recumbent bike that works best for you. Shorter riders may find bikes with smaller front wheels to be comfortable because the seat height is lower. Taller riders usually have more options for comfort but before deciding on a bike you should always test it for comfortability and to make sure that the cycling motion and pedal stroke is suitable for you. Long wheelbase (LWB) recumbents with low bottom brackets are typically good for overweight riders or for cyclists with circulatory issues in their legs. Short wheelbase (SWB) recumbents are sportier and may be more suitable to your personal riding style. Riding Style: Just like upright bicycles, some bent bikes are designed with comfort and relaxation in mind, whereas others are designed for performance and speed. While high performance models may not be less comfortable, they usually are more expensive. If traffic and road congestion aren’t concerns, a lowracer can be a good option because they have the best aerodynamics. If speed is a main interest and you’ll be riding in areas with increased traffic or tackling large hills, consider a highracer model because you’ll get a more efficient drivetrain and your visibility will be increased. A good rule of thumb is the higher the bikes’ bottom bracket is from the ground and the more reclined the seat is, the more aerodynamic you’ll be. These models will require more skill to maneuver and master, however. Conversely, recumbents with a lower bottom bracket and more upright seats (like the CLWB or LWB) are very easy to ride and are popular with beginner bent riders. Fitness Level: Because getting used to “bent” cycling form isn’t an overnight phenomenon, we suggest opting for a model designed for comfort if you are either new to recumbent bicycles or if you fall into the category of riding around every once in a while. Avid cyclists and experienced bent riders are usually more suited to high-end options and will get the most bang for their buck this way. Unless you’re always starting your rides from your home, you’ll need to transport your recumbent bike to a local bike trail or other starting point. Before buying a rack, consider a few key things: How many bikes will you be transporting at a time? Are you able to lift your bent over your head? Will you be parking outside or in a garage with low overhead clearance? Not all vehicles are compatible with all racks and some racks are better suited for recumbent bike frames. Pros: Easy to use, easy to install with a receiver hitch, can carry multiple frames at once. Cons: Need a receive hitch on your vehicle, racks stick out behind the vehicle, can block access to your trunk. Pros: Can carry multiple bikes, trunk remains accessible, easy installation, bikes won’t touch each other or your car if you hit bumps in the road. Cons: Bikes must be lifted to the roof, bikes must be removed before entering a garage, very high clearance height. Pros: Configured to fit multiple vehicles, fold flat for compact storage. Cons: Bike can rub/bump each other or your car, lower security for your bikes, block access to your trunk, may not fit your vehicle well.